Living with missing teeth causes serious problems. Discover why dental implants are the most durable, effective, and long-lasting treatment for restoring your smile. Missing teeth can cause a number of problems. In addition to the appearance problems and loss of self-confidence that accompany a gap-toothed smile, the loss of natural teeth can lead to the migration of other teeth, difficulties with eating and speaking normally, increased risk of gum disease and tooth decay, and even deterioration of the jawbone. Fortunately, thanks to modern developments in implant dentistry, all of these problems can be corrected with attractive replacement teeth attached to dental implants. 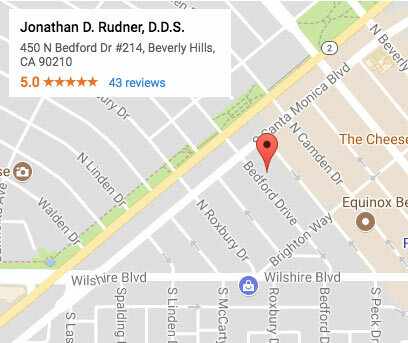 Beverly Hills and Santa Monica implant dentist Jonathan Rudner excels at treating patients who are missing one or many teeth and creating natural-looking results that are both completely functional and strikingly attractive. Dental implants are titanium-based artificial tooth roots that are implanted in the jawbone to provide stable anchoring points for aesthetically attractive replacement teeth. Because titanium readily integrates with natural bone material, there is no chance that the implants will be rejected by the body. Once the implants are fully osseointegrated, long-lasting, attractive artificial teeth will be attached to them. Your new restorations will be color-matched to blend in with your natural teeth, creating a seamlessly natural-looking and appealing smile. To find out more about what we can do to restore your smile using dental implants, schedule an appointment with Beverly Hills implant dentist Jonathan Rudner today.